Filings with the Eurasian Economic Commission (EEC) appear to indicate new models of iPad could be on the way, with six model numbers potentially covering both a refresh of the standard-sized iPad as well as the rumored fifth-generation iPad mini. 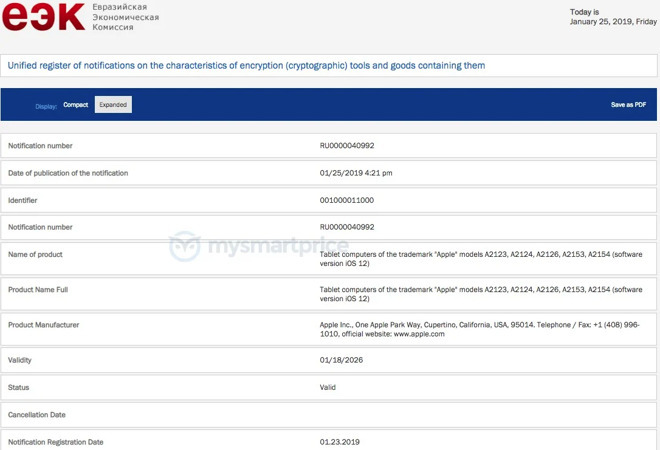 The new filings with the EEC reveals the six model numbers are "tablet computers" and are registered to Apple. Published today, the notification advises the tablets are certified for sale in Russia, due to the inclusion of encryption-related features. The six model numbers are A2123, A2124, A2133, A2152, A2153, and A2154, reports MySmartPrice. The sequential nature of the model numbers, and the grouping, suggests there are at least two different types of device they apply to, with the A2123 and S2124 likely to be for a different model to the rest. EEC filings showing new model numbers for Apple "tablet computers"
The presence of the filing suggests there could be a launch of new iPad models in the relatively near future, but doesn't advise of when exactly it could be. Considering the last iPad launch took place in March 2018, excluding the iPad Pro refresh, it is likely that whatever Apple has planned for the iPad product family will be unveiled at around the same time. The iPad refresh is rumored to include elements borrowed from the design of the iPad Pro, potentially incorporating a larger display in a similar-sized body and a thinner construction. A 10-inch display has been touted, though a shift to Face ID from Touch ID has yet to be suggested. 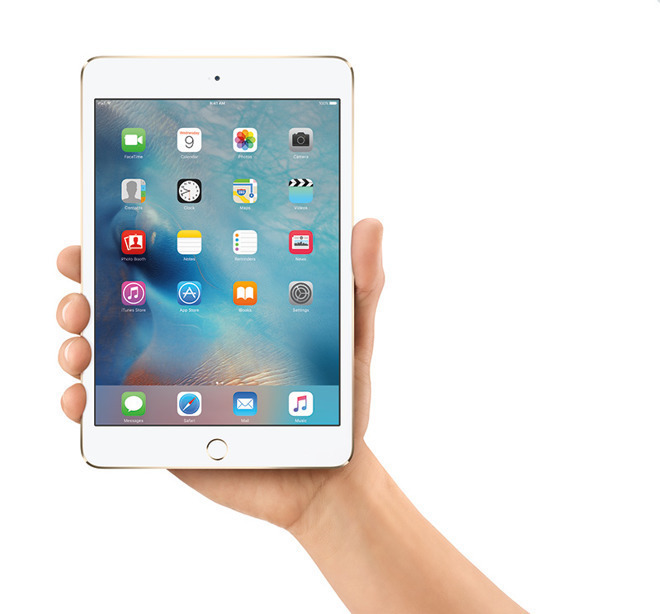 Little has been speculated about the new iPad mini, except that it would be a new low-priced model compared to the more recent release. If launched, it would be the first update to the product line in over three years. Update: A seventh iPad model designated A2126 was filed with the ECC on Friday. Please, please, please… don't make this an all lowbudget-line of iPads with no Pro-level mini. I heartily agree with Svanstrom, there are many people that want a powerful feature rich iPad in a small form factor. If Apple can do it in an iPhone, they can do it in an iPad mini. Powerful lightweight small form factor portable devices, are much more convenient for travel and everyday use. The large iPads are still too bulky and heavy to carry around all day. An iPad mini with a better processor, and an enhanced display could be used in many professions as a regular tool. I’ve been waiting for one to appear for many years, and I’m sure that many others have been waiting as well. There is lots of pent up demand if Apple releases a decent upgrade. I'm looking forward to a new mini, and hope it's not a 'budget' model. But that pic is actually of a prototype iPhone XI. The 5th Gen mini is smaller. I would expect a low priced mini, respective to the Pros. Mostly a spec bump device, maybe an improved screen. That’s about it. If Apple takes 4 years to update it, they have the numbers to say it’s a niche market, especially with the iPhone max and Xr. The screen also limits the need for the “Pro” features. The pencil is less useful, a weaker processor and graphics processor can drive a smaller screen, etc. I'm fine with a mini that has an upgraded screen and touch ID. Make it $199, and I'll buy on launch day. Make it "pro" and over $275, and I'm out. I don't expect Apple to do anything more than a mere spec bump to both of these devices. In that context, I would love for Apple to at least update them using the A12 SoC that's used in the iPhone XR. I just purchased two Mini 4s, so I hoping this if not true. But if Apple does release a new upgraded Mini, make it on the level of the Pro line, not a “budget” type iPad level - 2-3 year components and the minimum RAM. Ugh! Pencil support would be a dream come true. I'd be able to finally ditch the A5 notebooks that I've always carried since high school. I'd buy a mini for someone as a gift on release, its just the right size for some ladies handbags. I don't see the need for a pro-spec or a pencil on the mini, just the latest bits and an update screen. All good. I’m a heavy iPad Pro user with Pencil for note taking. I frequently have the Apple Pencil in my hand and start to try to navigate or take notes on my iPhone before I suddenly remember that the Pencil won’t work with them. Apple should offer Pencil support on all of its mobile devices in my opinion. Have you read the other comments who want the Pencil? In which case, do you see the need now, if not for yourself, for others? With the current crop of iPhones being as large as they are, Pencil support seems to be an entirely reasonable addition, particularly to the "Max"-sized models. Arguably, the Pencil make navigating smaller screens easier, so I would suggest, as do you, that every iOS device support it. But considering the ever increasing cost of phones, it's unlikely they would add a truly optional feature if it were to increase the cost. Certainly I wouldn't expect any iPhone to be capable of charging the Pencil in any event. I have the iPhone max; still want an iPad Pro Mini, with pencil support. Would be very useful for work. As a student, I think an iPad mini with pencil support would be AMAZING! It would be great for note taking. I could see offering Apple Pencil support to a refreshed iPad mini, but that would nullify the idea of a budget device. Apple has a very long and well-established history of leaving off certain features to push "upsizing" to the more expensive models, so I don't doubt that something the larger iPads have will be something the iPad minis lack. I'm fine with a mini that has an upgraded screen and touch ID. Make it $199, and I'll buy on launch day. You are in for a disappointment. That is what they do. I'm also hoping for a mini with the usual bumps and Pencil support. And I to may be in for a disappointment. I think the Pencil is a natural for the mini as a notepad, for private and enterprise use. Other than voice recording, I don't think there's a faster way to take notes than just jotting things down, and it would be especially convenient on a mini. Typing isn't even close. Combined with a handwriting recognition app (yes, I know Apple tried that once before), notes could be quickly taken, stored, or sent as needed. The mini would be handy for anybody on the move, and even handier for realtors, architects, or anybody needing to make notes or sketches on the fly. Apple could cut back on some features or specs and still have Pencil compatibility. That would make the mini a more compelling choice. Even if Apple made it a Pro mini, it wouldn't have every bell and whistle of the other two Pros, but it would have Pencil support. I'd take either mini.